The future location of Dirty Water Bar (if Google Maps is correct). A new bar will be opening in early 2014 called ~DIRTY WATER BAR~. Eater announced Kristian Cosentino (previously a GM at Press Club) is behind the bar, which is going to be quite the project. The 8,600-foot-space will include a 150-foot bar (yeah, you read that right) and three lounge areas, plus communal tables and tables for six. The bar program will include hard-to-find, very top-shelf spirits, a choice selection of beer (there will be 51 short-draw taps), wine (with 100 by the glass—he’ll be using Coravin for two- and five-ounce pours of high-end wines), a limited menu of cocktails, and there will be food as well. The buildout is still not under way, so stand by for updates in the New Year. 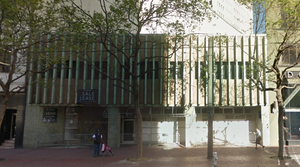 1446 Market St. between Van Ness and 11th St.
Over by Trick Dog, there’s a new bar that should be coming in the future, but there are some change-of-use permit hurdles to cross first (the space is currently used for tool storage). It will be called ~THE TRADESMAN~, and Scoop mentioned Zarin Gollogly and Spencer Lafrenz (Harrison Woodworking + Design) are behind the project—they have done woodwork for Hog & Rocks and Hi Lo BBQ. The 1,400-square-foot space will be casual, with TVs, and there will be bar snacks (courtesy of Scott Youkilis). Stand by for more on this one. 753 Alabama St. at 19th St. 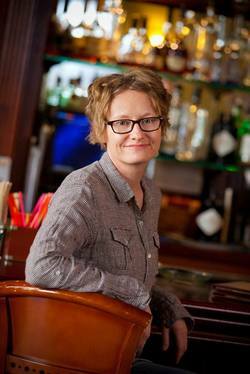 Author Amy Stewart, at the bar of course. Photo from Facebook. One author has taken the meaning of botanicals in alcohol to a new level: Amy Stewart’s book, The Drunken Botanist: The Plants That Create the World’s Great Drinks, is all about the plant origins of everyone’s favorite adult beverages. On Thursday October 3rd, join Stewart for a tour, talk, and reading from the book at the Conservatory of Flowers in Golden Gate Park—cocktails included. During the tour, she’ll take you through the gardens, with a cocktail, of course, pointing out the various specimens that are used in drinks. The tour runs from 6pm-7pm, and the talk runs from 7pm-9pm. Tickets to the talk cost $40 per person ($35 for Conservatory members), tickets for the tour are $100 ($75 for members), and include the talk. 100 John F. Kennedy Dr. at Conservatory Dr., 415-831-2090. The week of September 23rd-27th, head to ~ELIXIR~ for Whisk(e)y Week 2013, with various tasting, distillers, and whiskey aficionados all in one place. The full schedule of events is right here. Also check out a special tasting with Four Roses bourbon on Friday September 27th from 12pm-2pm; tickets are $45. 3200 16th St. at Guerrero, 415-552-1633. The scene at the California Wines Road Trip tasting in 2012. Photo from Facebook. Join Pamela Busch at ~RAGAZZA~ on Saturday September 21st from 12pm-3pm for a Harvest Wine Tasting. The tasting will focus on some lesser-known wine-producing areas in Eastern Europe, including Croatia, Slovenia, and Hungary, with wines from importers Blue Danube Wine and Return to Terroir. Bryan Harrington of Harrington Wine will also be in attendance, pouring his pinot noir from 2002 to the present. Ragazza will be providing snacks too. Tickets are $30 per person ($18 for trade), and $6 of each ticket sale will be donated to The George Harrison Fund for UNICEF. 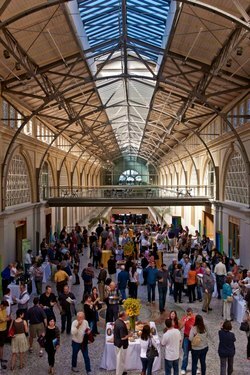 Also on Saturday September 21st is the ~CALIFORNIA WINES ROAD TRIP~ event at the Ferry Building. From 2pm-5pm, check out pours from 12 different regions throughout California, including Napa, Paso Robles, Santa Cruz, and San Luis Obispo; here’s a list of the participating wineries here. Tickets are $35, and a portion of the proceeds will go to CUESA. Ferry Plaza, Second Floor.